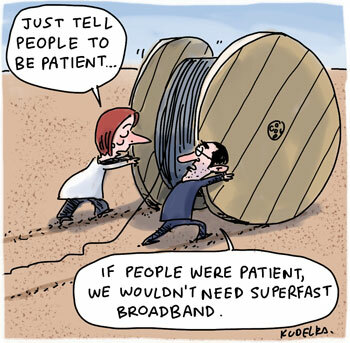 The word is that Julia’s deal with our new rural overlords is slowing down the NBN rollout. Fair enough, sheep need broadband too, but I want my ridiculously fast broadband now, and one of those flyings cars we’ve all heard so much about. Cruel. I just wanna tap the fibre that’s been sitting outside my front door for over two years. Now it seems the Tas Liberals will have to have a third NBN policy because Turnbull’s talking about having some new policy for the next election. They’d better hurry up. All I’ve got is 100Mbps Cable. A clue is that the cartoon accompanied a story about how the NBN has been delayed, so it’s almost possible that was deliberate. But thanks. Internet’s too slow? How cute. Canada’s fastest internet is 25 mbps, and that is brand new. I believe it was about 10 before. And of course, it’s never REALLY anywhere near that speed when you want to use it. With that plan, for a whopping $53 a month plus taxes and hidden fees? You have a data cap of 75 gigs a month. So no, no whining for you. Okay, Canada’s internet is complete crap. Congratulations, you live in a third world country. Deal with it. i am analyzing this cartoon for a uni speech.. any info about cartoon visual analysis? and background about the broadband debate would be much appreciated!! i am so desperate!! HELP!! Hey Amelia, not entirely sure what cartoon visual analysis is, but I’m going to take a punt and suggest that it is best done by looking closely at the cartoon in question, preferably under good lighting conditions. For background about the broadband debate, you’ll be wanting google. Damnably slow at the moment, admittedly, but persevere. How is the ability to download a TV show in the amount of time it takes to play while severely under the advertised highest speed “third world”? Excuse me, but internet speed has nothing to do with development of a country. You’re calling a country which from any source is listed in the top 20 richest countries 3rd world? You’re calling a place where over 90% of the residents have both food and shelter third world? Are you over-privileged or what? Internet access is a LUXURY not a RIGHT. j, if you had a proper broadband service like first world countries, you could conduct humourless rants in fullscreen HD video. It makes all the difference. I can and do download HD videos. It takes slightly longer. Oh no. I might not get to watch TELEVISION HOW UNDERFUCKINGPRIVILEGED this country is that frivolous entertainment might take ever so slightly longer to receive. J, you seem to have misunderstood, which is perfectly understandable considering your “privilege challenged” life (we don’t really like to use “UNDERFUCKINGPRIVILEGED” in the civilised world). In my country, we can not only download HD videos, we can also talk to people using video in real time! It’s like the device you might know of as the “telephone” (there’s probably somebody in your village who has one) except with moving pictures as well. Uh yeah again, I can do that perfectly fine as well. You’ve obviously been mislead in regards to just how fast 25mbps is. Or rather, how fast it still ends up even after all the lies including that being the neighborhood’s total speed have been taken into effect. Look j, you don’t have to defend Canada’s pathetically slow broadband speeds by pretending to know how the internet works. It’s perfectly adequate for your people’s simpler needs and the citizens of more technologically advanced nations respect that. Really, we do. It’s great that you’re even participating in this debate at all. Huh. Seems our average is umm…let’s see, 6 spots ahead of the US and 17 spots ahead of Australia. So much for inferior. And btw, I don’t even have that fastest internet. I pay much less a month and support a smaller company and get only 5mbps. I can still video chat. I can still download non-hd films and tv shows in approximately the time it takes to watch them. Often less if I use a good torrent and it is a time of day where less people are using the internet in my building. And if I want an HD show, which I don’t because there is no difference on a 15 inch screen that my eyes can tell, then I simply have made the choice and have to wait a bit longer. j, it’s OKAY that you come from a backwards country. no need to keep trying to cover it up with spurious statistics. It’s also perfectly okay for you to be more backwards than your average countryman with your extra slow broadband and tiny monitor. Some people simply aren’t equipped to cope with faster speeds or properly displayed HD video. Hi John we are analysing this in school (In fact every grade 10 student in australia is through the national curriculum). I was wondering if it was intended that the spool of wire is the wrong way for rolling out to signify the impossibility of the task. Hey Chale, don’t you kids have anything better to do? Yes the spool is upside down deliberately. Nothing so profound as signifying the impossibility of the task, just a little extra gag pointing out some of the teething troubles of a fairly monumental task. Honestly, it was a last-minute decision as those front page pocket cartoons are always done in a hurry, and on reflection I’m not sure it was a good idea as it somewhat confused the message of the cartoon, which can be a problem as generally you shouldn’t try to get too cute with pocket cartoons.